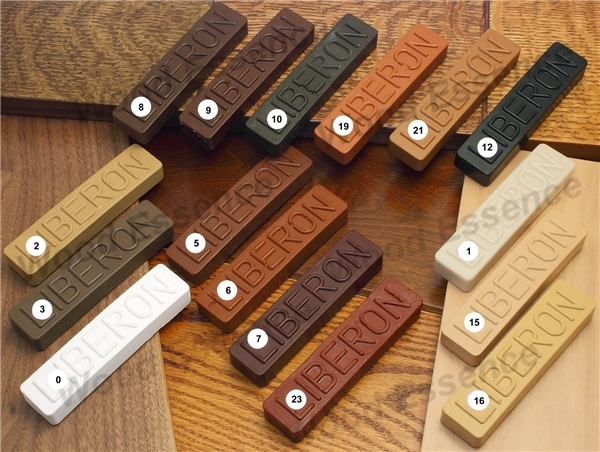 Wax Filler Sticks by Liberon are widely used by furniture repair services and by manufacturers to make minor repairs to finishes. Filler sticks are intended to be softened by the heat of your fingers and then pressed into cracks or holes and allowed to harden. The repaired area can then be trimmed level and then polished over with shellac, varnish or traditional waxes. Available in a range of colors. Choose a color slightly darker than your finish for a less obvious repair. Each stick is roughly .75 x 1.25 x 4.75 inches and weighs just under 2 ounces. Available in 16 shades to match your project finish. 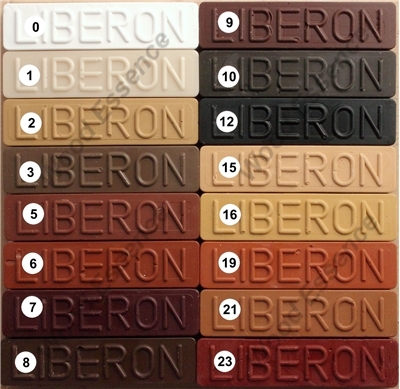 Colored wax helps to fill scratches, blemishes and marks. Apply by trimming a piece from the filler stick, then softening in fingers and pressing into crack or hole. Trim level and buff. Filler will harden and set. Purchase Individually or at discounted pricing in groups or full sets.